Home > Why Alcohol & Drug Rehab in Thailand? DARA is the leading international destination for drug and alcohol rehab treatment in Asia. We offer a professional, private, world-class treatment program. Our flagship location is in a tropical island paradise on the cliffs of Koh Chang, Thailand. We can help. To the best of our knowledge we are the most cost effective center in the world. We believe everyone should have a chance at world class drug or alcohol treatment and have structured our program such. At DARA you will receive equivalent, or better, treatment to programs easily charging 10 times our rates. We have been operating longer then any other center in Thailand, and can draw on the most professional and highly trained counselors working in the region today. We have helped hundreds of clients from over 50 countries. Asia’s only non-12 step treatment center. DARA – Drug and Alcohol Rehab Asia is a non-12 step center. However, we do acknowledge the benefits of the fellowship for some people and will work with you towards your goals. We are partners with Bangkok Hospital-Trat, a JCI and The European Aeromedical Institute accredited hospital. Upon arrival at the Trat Airport, you will be escorted to Bangkok Hospital-Trat by an English speaking member of their staff. 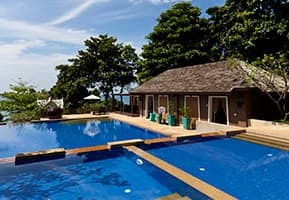 All clients, before entering rehab at DARA, will be admitted to Bangkok Hospital-Trat for 24 hours for a full medical assessment and observation which is included in the price of your DARA treatment package. Medical detoxification can be facilitated as part of your program; you will, however, be responsible for the fees directly to the hospital. This process is still substantially less expensive in Thailand then in Western Countries. The most highly experienced and qualified Western therapeutic staff working in South East Asia. We have a large network of aftercare specialists around the world that we regularly work with. If you come from an area where we cannot locate a suitable therapist, we know several counselors who specialize working on the telephone and via videoconferencing. Your aftercare will be arranged prior to your departure. Our therapists are experts in different aspects of addiction and mental health. We can choose the right therapist for your immediate needs. This is your rehabilitation programme, and we fully understand that some of our clients need to maintain connectivity and productivity while undergoing rehabilitation. There are no restrictions on mobile phone or internet use during non-course hours. Bring your laptop and use the WiFi, or use computers provided for you at the center. No record of your treatment on file with your government, insurance company, employer, school, etc. Unless you tell someone, no one will ever know about your treatment from us. * Extra security measures are available to ensure your safety and privacy if necessary.